In order to accept online payments via Paypal for your issued documents, you need to have a PayPal account first. In case you want to create a new account, visit www.paypal.com and follow the registration instructions. Note: In case you want to issue documents in foreign currencies please make sure PayPal supports those currencies. In case you already have a PayPal account, its integration with Elorus is quite simple. From the main menu select “Settings-> Payment gateways”. Then, click “Add” and from the list of options select PayPal. 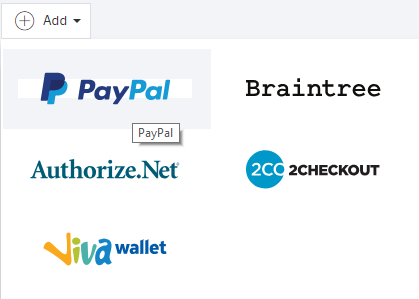 The first step to establish a new payment gateway is to determine its title. The title will be visible to your customers upon making an online payment. Make sure that the gateway is “Active” and if you want PayPal to be an available option in your new commercial documents, activate the “default” field. Regarding PayPal, the only mandatory information you have provide Elorus with is your account’s ID. Your ID is the e-mail address with which you are registered in PayPal. Be sure to type the email address correctly and then click “save”. You have now integrated Elorus with PayPal and can accept payments automatically! For more information about payment gateways and online payments instructions, you can refer to the related article. Depending on the settings and type of your PayPal account, you may need to log in to PayPal and manually accept a client’s payment after it is completed. The most common reason for that to happen is that your PayPal account is not validated or you have received a payment in a different currency from the one primarily set in your PayPal account. In that case, the money transfer is completed only after you have validated your account. If this keeps reoccurring, you should check your PayPal account settings or contact PayPal’s Customer Support.